Learn about my new book, HANDWRITING CAN MAKE SENSE, at http://youtu.be/fKc3Hgz_Y6Q — this is an upcoming episode of the WCTV (Wethersfield, Connecticut) television talk-show MEET THE AUTHOR, hosted by producer/educator Jason Alster. The episode, which will air in a week or two, is a special extended 45-minute program: the show usually follows a 30-minute format. The book, HANDWRITING CAN MAKE SENSE, is available here or through my web-site’s front page: click the large “think” graphic (the book’s front cover) to reach its download link. Posted on June 26, 2015 July 6, 2015 3 Comments on I am on TV! Since my work includes developing handwriting instruction and remediation software for iOS (most recently, READ CURSIVE by WebTeamCorp), now and then I’ll review iOS software (as well as other resources) for a variety of academic subjects: particularly handwriting, of course, but occasionally others. (I prefer to review software that relates to handwriting and/or to other aspects of language and literacy, but will review other items that also come to my attention. — especially in spelling, arithmetic, languages, and other subjects I’ve tutored. Since WebTeamCorp produces my handwrting software, they’ve asked me to take a look at their iOS spelling practice game SPOT ‘N SPELL (version 1.0.0, release date September 24, 2013 — for iPhone and iPad). The left-to-right convention is so important in reading that it is unwisely violated or weakened in the graphics of a spelling instruction program, especially one for beginners (which “SPOT ‘N SPELL” is). I trust that WebTeamCorp will correct this graphic glitch (and the use of “n” for “and”) in subsequent releases. The content (and the rest of the presentation) is rather better, and somewhat more entertaining, than the opening screens had led me to fear. 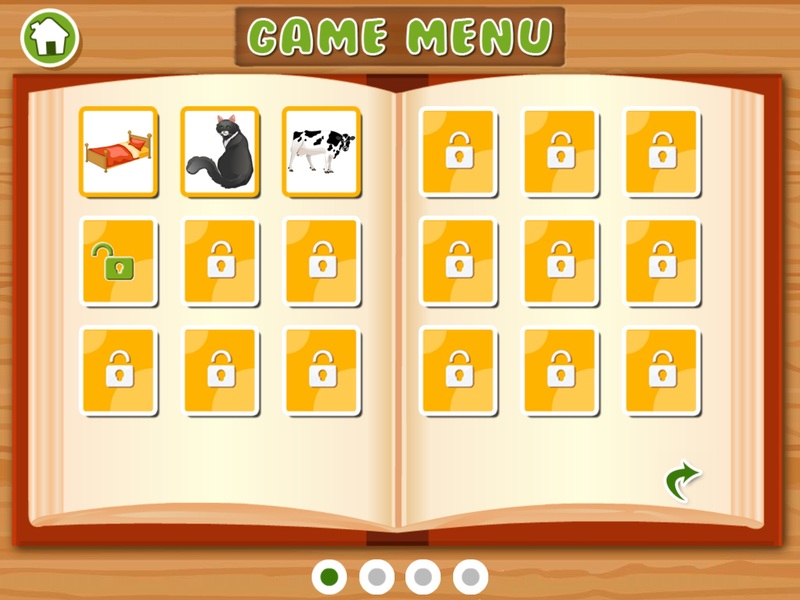 A soft burst of music — rather than the intrusive audio of too many educational games — opens the game, which begins with access to player instructions and a choice of “modes” (words in upper or lower case; background music on or off). • Why is the target word (“dog, cat, cow,” or whatever) illustrated only with a bland little postage-stamp-sized graphic in the lower left-hand corner of a bright, bold, visually busy full-screen scene (farm, cityscape, or whatever) jam-packed with objects? Why not make the target item illustration fill the entire top of the screen, and float the letters across some empty space in the screen’s bottom half? This would vastly increase the odds that the student would have a fighting chance to notice and respond to the correct stimulus instead of the pretty, eye-catching background. When I looked at the first level (a teeny-tiny bed in one corner of a bright blue city skyline), it took me a few minutes to find the bed and conclude that “bed” was what I was being asked to spell — minutes during which I frustratedly scanned the cityscape, looking for something there that might have a three-letter name as required by the three letter-slots provided. If a fifty-two-year-old literacy tutor with a Master’s Degree in Library Science has this much trouble finding out what she is expected to do, a kindergartener or first-grader or other beginning reader will certainly have as much trouble. 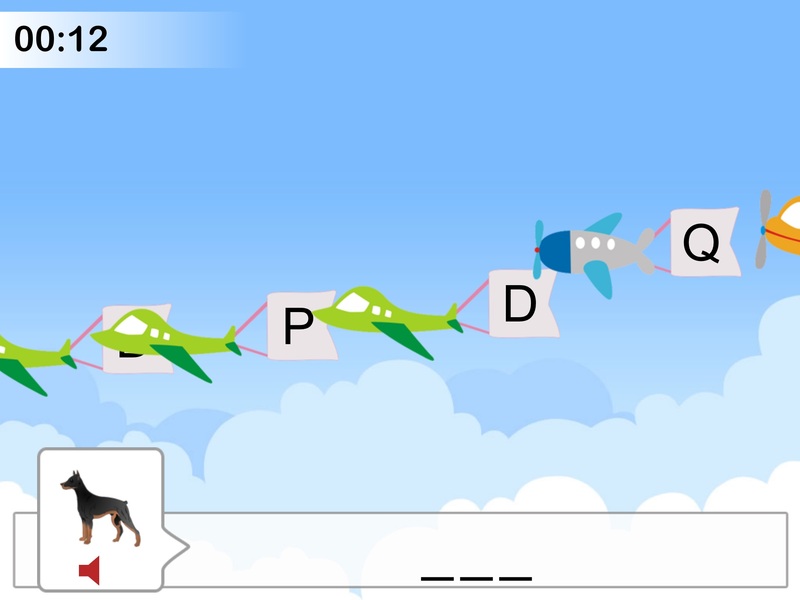 A game that is meant to teach spelling should not, simultaneously, add vast perceptual demands to the task of simply finding out what one is being asked to do. 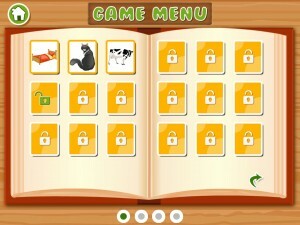 • A further problem with the game’ s limitation to easily picturable words is a cognitive/language development problem. Even most of the simplest words that a child ever understands and uses and needs to spell are words that are not as simply picturable as “dog” or “cat” or “cow.” Even the vocabulary of a very young child includes (and needs to include) literally thousands of words that aren’t conveyable by drawings alone — how do you draw a picture of “this” or ”what” or “think” or “yesterday”?) 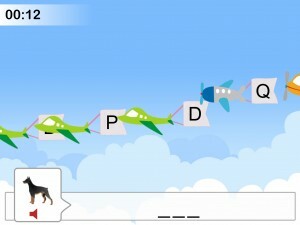 A spelling game that limits itself and the user to picturable words — as too many literacy games and language therapy programs, and even some curricula, limit themselves — is setting students up for a fall as they try to use their spelling, because limiting spelling to picturable words can implicitly convey the message that non-picturable words should not be used, should not be understood, or do not need to be spelled correctly. (I deal with this sometimes as a tutor, when I am working with kids, teens, and even (increasingly) young adults whose reading/spelling instruction rely largely on the sort of games or flashcards or other resources that focus only/primarily on picturable words. Some of them — particularly those in special education programs, which I know to be a concern of WebTeamCorp — have come to me with the assumption that only the picturable words in a sentence had to be read or written; others, in “regular ed” as well as in “special ed,” have assumed that spelling mattered only for the easily picturable words in our language, and not for any of the others. Neither of these is a realistic assumption to allow kids to fall into — yet the “hidden curriculum” of any picturable-words-only spelling program, including this one, will nudge a certain percentage of learners into assuming that spelling doesn’t matter except for a relatively small subset of the words in the English language. (Given the complex spelling of English, and the fact that people’s intelligence and even their work ethic is often evaluated on th basis of how well they manage the spelling of English, encouraging students to master and care about the spelling of picturable words only is not only unrealistic, but educationally and vocationally perilous.) WebTeamCorp could easily avoid the unintended consequences of limiting their program to picturable words by developing one or more expansion packs which addressed non-picturable words (that would be presented as audio-only). • A further overall concern about SPOT ‘N SPELL (as with most other spelling instruction software and curricula I have seen) is the extent to which it ignores the research on spelling development: specifically, the research showing that the most common method for teaching the spelling of English (the memorization of series of words which are structurally and orthographically unrelated to one another) is documentably not productive of correct spelling. (See, for instance, the research summarized and cited at the learning disabilities/literacy research and practice site AVKO.org.) Yet this most common method (the memorization of structurally and orthographically unrelated series of words) is what SPOT ‘N SPELL unfortunately is built on, underneath all the charming (if sometimes confusing) eye-candy. 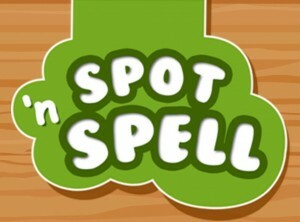 SPOT ‘N SPELL is about as good, overall, as most spelling resources on the market — which means that it needs improvement. I know enough about WebTeamCorp, through professional contacts over the years, to be sure that they are committed to achieving major and evidence-based improvements in all of their products, including this one — I eagerly look forward to version 2 (and would gladly help with it, if they asked). In this blog, I aim to discuss handwriting, reated sites and resources, and (occasionally) other matters. Please suggest what you’d like me to cover or respond to. Posted on May 16, 2015 May 16, 2015 15 Comments on Hello, world!